Themed evenings are fun for big parties, small parties, and even low-key casual gatherings! A theme is fun, makes a great ice-breaker for guests who might not already know each other, and makes the event much more memorable for everyone! While some themes are seasonal, an Old Hollywood themed party is great at any time of the year. It’s glitzy, glamorous, and promises an evening full of merriment! Setting the scene properly for your Old Hollywood night is key. From the moment your guests walk into the party venue, they should feel like they’ve begun a journey backwards in time, into the decadent world of Hollywood’s elite. Start with mood lighting. Light dimmers start at only a few dollars each, but this cheap trick is so great for parties! If you can get a smoke machine, the dim light and fog will work together to reflect an earlier time, pre-indoor smoking bans, when Hollywood’s fat cat producers puffed on expensive Cuban cigars as they lounged on plush cushions. If your sofas and couches aren’t already of a dark material, cover them with velvet covers in crimson or black. Gold accents, like gold thread tassels, are a great touch! Dress your tables with long black tablecloths and set them with long-stemmed champagne flutes. Serve bubbly if it’s in your budget, but otherwise substitute with cheaper carbonated beverages, like sparkling cider! 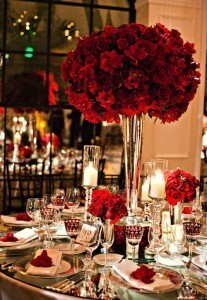 Vases of lush red roses or empty film reels make excellent centerpieces! Serve popular hors d’ouevres so your guests can enjoy delicious refreshments while they socialize. From pigs in a blanket to shrimp in cocktail glasses, from mini quiches to lettuce cups, there are so many fun, elegant foods to choose from! Your guests will want to fit into the beautiful scene you have created for them, so tell everyone beforehand to dress up in their vintage Hollywood best! Long satin gloves and dramatic costume sunglasses pair perfectly with faux-fur wraps, nice dresses, and faux-diamond costume jewelry for the ladies. 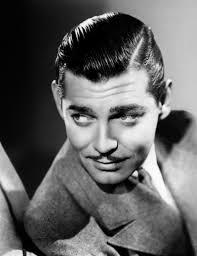 For the men, it’s all about tuxedos, bow ties, top hats and bowler hats, and white gloves. You’ll look, feel, and party like old-timer A-listers! 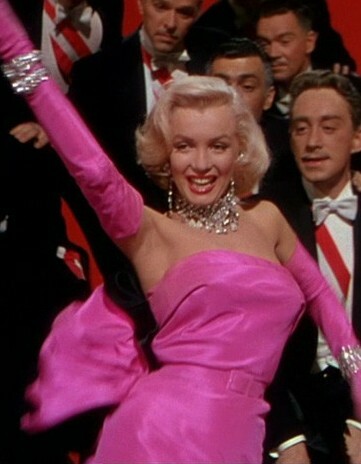 Play old Hollywood trivia, where teams of guests compete to see who knows the most fun facts about iconic classic actors like Marilyn Monroe and Charlie Chaplin. Hide prop look-a-likes from popular movies, like a fake Charlie Chaplin mustache, and have guests go on a scavenger hunt for them! When everyone is ready for calmer moments, enjoy some classic movies and silent films. Wrap your evening up as strong as you started it. Send your guests home with little black and gold gift bags filled with mini champagne bottles, polaroid photos from the evening, gold star stickers, and chocolate Oscars! A party doesn’t happen every night, so you want it to be memorable when it does. With a well-executed theme, like this Old Hollywood evening, you will create plenty of wonderful memories to last through all the quiet evenings! Your party will be the talk of the town long after all the party decorations are cleared away.